Line play and extra effort pave the way to a convincing Class A victory against Massabesic. Play to the whistle. Every football player hears every coach preach that mantra. 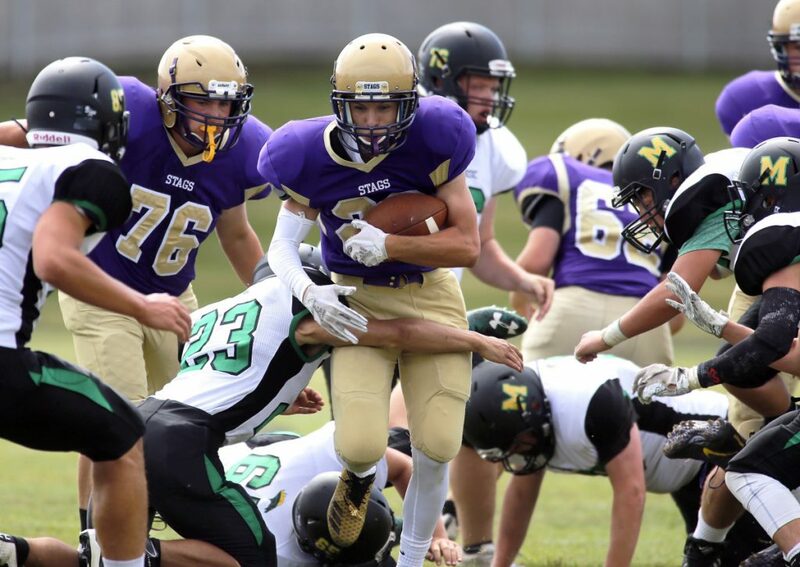 Cheverus High was already gaining control of its season opener Saturday against visiting Massabesic when senior fullback Teigan Lindstedt heard silence instead of a shrill tweet. Stuck in the middle of the line, Lindstedt kept playing when Massabesic relaxed and broke around end for a 14-yard touchdown and, after the officials conferred, a 15-point lead. From that point, there was no stopping the Stags. With a brand-new offensive line paving the way, Lindstedt and Ian Trafford combined for 310 rushing yards in a convincing 43-6 Class A victory at Boulos Stadium. Prior to Lindstedt’s extra-effort touchdown, Massabesic quarterback Nick Roberge had capped a 64-yard drive with a 28-yard run that cut the lead to 15-6. Cheverus responded by running the same off-tackle power play with Trafford (20 carries, 165 yards, three TDs) on five straight downs. With dual tight ends Vick Morrone and Keagan Rice flanking first-time starters Aaron Merrill (left tackle), Tim O’Brien (left guard), Mitch Cloutier (center), Giovanni Fornaro (right guard) and Sean Sullivan (right tackle), Trafford gained at least 6 yards each time to set up Lindstedt’s touchdown. Cheverus’ defense and special teams did their part as the Stags finished with a 414-188 edge in yards. Colt Dumond and Anthony Pacitti intercepted Roberge passes. Morrone blocked a punt with 44 seconds left before halftime. Trafford scored from the 4 on the next play, and with the kick from Cam Harris (5 of 5 on PATs), Cheverus led 29-6 at the half. Trafford scored on 6- and 33-yard runs in the third quarter. The latter touchdown started running time with 5:45 left in the quarter. Cheverus ran out the entire fourth quarter on a 17-play, all-run drive that did not result in a score. After a scoreless first quarter, Cheverus took a 15-0 lead on two long runs off trap plays. Fornaro sprang Lindstedt (seven carries, 145 yards) for a 72-yard score. Quarterback Marc Reali connected with Marrone on a 2-point conversion pass. On Cheverus’ next possession, Merrill’s tackle trap freed speedy Sean Tompkins for a 60-yard touchdown. Cheverus faces rival Portland on Friday night at Fitzpatrick Stadium in an early season Class A North showdown. Portland routed Windham in its opener, 49-0.